As you may know by now, Network Insight listens to everything going on inside your network and creates intelligible information out of it. You get a crystal clear donut-shaped diagram that tells you, in one view, exactly which applications and workloads communicate with each other. Furthermore, it gives you a set of recommended firewall rules that are applicable to your applications using an advanced learning engine. These recommended firewall rules can be used to create a micro-segmented environment and accelerating the security of your applications significantly. Assuming you already know about vRealize Automation (if not, go read up first 🙂), I’ll dive straight in. As an example, I’ll be using a 3 tiered application blueprint that contains a web server, application server, and database server tier. Of the web and application tiers, there can be multiple VMs deployed but there’s just one database server. They are linked to vSphere templates which will be cloned when a deployment is requested. We can use this blueprint design to extract the application stack structure and automatically insert that information into Network Insight using its open API. The Blueprint name will be used for the application name and the VM tier names will be used as the tier names inside Network Insight. 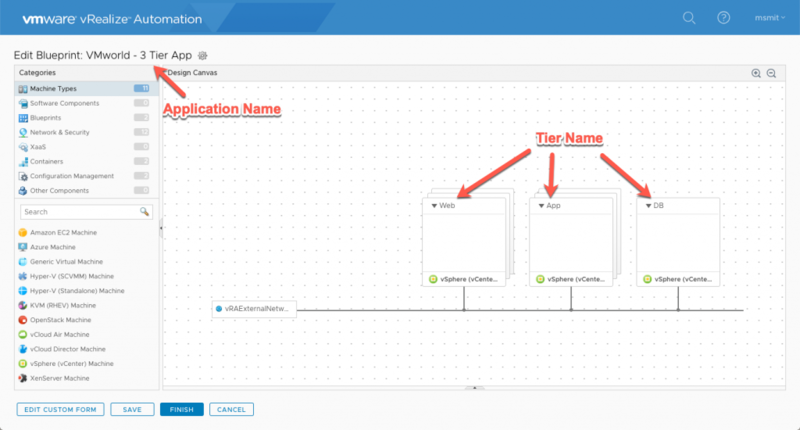 vRealize Automation has to be added into the Orchestrator instance for it to connect to it and get information about the deployments. 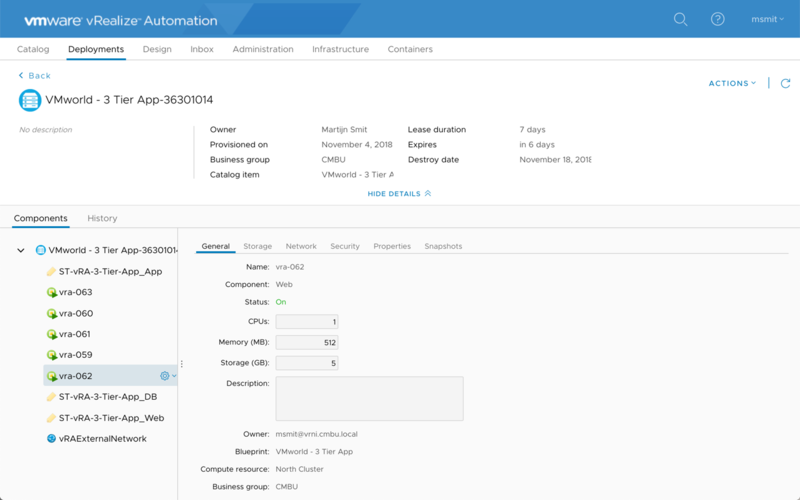 Use the workflow vRealize Automation -> Configuration -> Add a vRA host to do so. I’ll explain exactly what I’m doing here, going through the scriptable tasks step by step. // IMPORTANT: This needs to be your vRA host. In my case it happened to the third server configured. // there is probably a better way to handle this. 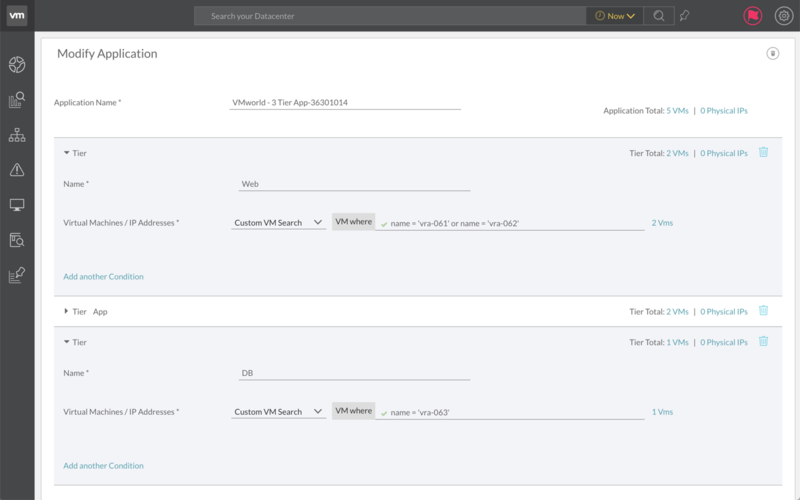 This uses the built-in functions to connect to vRA and retrieve information on the deployment that is given to the workflow. The payload variable contains a key named catalogRequestId, which contains the ID of the deployment. The response variable will contain the deployment info, including the VMs. // go find the tier name in the key/value array, the key is called "Component"
Here we parse the response variable and look for VM components and the deployment name and store these in variables. // Do things with the deployment name and list of VMs we've just queried vRA for. We’ve stored info VM specific so far, but we want to be tier specific. The Network Insight API calls are going to be per tier. After structuring the right variables, deploymentName and tierInfo will be passed onto the second scriptable task. This first part creates a few objects to manage REST calls and then requests a authentication from Network Insight. Don’t forgot to modify the first 2 lines and point them towards your own Network Insight instance. We’ve now created the application container inside Network Insight and saved the appEntityID which is returned on a successfull creation. The final piece creates the tiers using the appEntityID to create them under. It received the wanted tier names and the included VMs and builds a VM name filter to use in this new tier, referencing the VMs that were created. vRO is called when vRA finishes the deployment of the VMs and the infrastructure (networking, storage, compute) via the Event Broker. This is a model inside vRA where you can subscribe to certain events and start vRO workflows when that event happens. In our case, we need the Blueprint request completed event, which will execute when a deployment has finished and all VMs are running. To create this subscription, go to Administration – Events and then Subscriptions. Create a subscription there with the above mentioned event and select your workflow. If you’ve come this far; thanks for sticking with me! Network Insight integrations are an important part of gaining control of your application landscape and help keep it secure. This (long) post was based on customer demand which involved vRealize Automation. However, because the Network Insight API can be called from anything that supports HTTP calls; you can integrate any automation/orchestration product.